With the Texas Gal on vacation for a couple days following the holiday, it’s been a lazy time here. But I thought I’d take a few moments during a humid afternoon to look briefly at the Billboard Hot 100 from May 30, 1970, forty-eight years ago today. Sitting at No. 1 was Ray Stevens’ “Everything Is Beautiful,” a record I might have liked the first time I heard it. I soon tired of it, and today I find it trite and bathetic. But we rarely do much business around here with the top of the charts, and today, Odd, Pop and I are playing a quick bit of Games With Numbers and looking at the record parked at No. 30. And we find a record that’s never once been mentioned here in more than eleven years and about 2,400 posts: “Soolaimon” by Neil Diamond. That’s a little odd, given that I like Diamond’s work enough that his name is among the artists listed in the side column of both this site and the Echoes In The Wind Archives, which collects posts from early 2007 into 2009. But back to “Soolaimon” the single: I liked it well enough when it was on the radio, I liked it when I heard it across the street at Rick’s place, and I still liked it when I heard it from my own vinyl copy of the album, which I finally collected in Wichita, Kansas, twenty years after its release. (And as I write, I’m pondering whether I should shell out a few bucks to get the CD; I likely won’t.) So why have I never written about it? I have no idea. I wondered, as I often do, about other covers, so I took a quick look at Second Hand Songs. Now, I imagine that I’ve dug into titles at that website more than a hundred times over the past few years, and on occasion, I’ll find a listing for a reggae cover of a specific tune. But four reggae covers of the same song? Never. So, what is it about “The Last Thing On My Mind”? I’ve been pondering the song – written by folkie Tom Paxton and first released on his 1964 album, Ramblin’ Boy – for a couple of days, and I’ve come to only one thought about it: Despite some references to modern life – like subways – it has to me the feel of one of those songs that’s always existed, a song that’s evolved and come down through the years, loved and passed on from one generation to another. I’ve been able to track down quite a few versions of the tune. Among the earliest are those from the Vejtables (the California band I featured two days ago) and the soul/gospel duo Joe & Eddie, both from 1965. The Vejtables’ version bubbled under the Billboard Hot 100 at No. 117, and a year later, a version by a folk quintet called the Womenfolk went to No. 105. The only version of the tune to actually make it into the Hot 100 was a limp rendition by Neil Diamond, which went to No. 53 in 1971. And in 1968, the duo of Porter Wagoner and Dolly Parton took the song to No. 7 on the country chart, making “The Last Thing On My Mind” the first of many charting hits for that long-lasting partnership. British folk singer Sandy Denny recorded the song for a 1967 album featuring solo performances by her and by Johnny Silvo; the track was re-released in 1970 on Sandy Denny, a collection of Denny’s early solo work. I found the track that I used for the linked video on a German version of that 1970 album, and I thought it was worth hearing simply for the beauty of Denny’s voice, even though the backing track seems intrusive. One cover that seems familiar, though it got no Top 40 radio play, comes from the Seekers, found on their 1966 album Comes the Day. 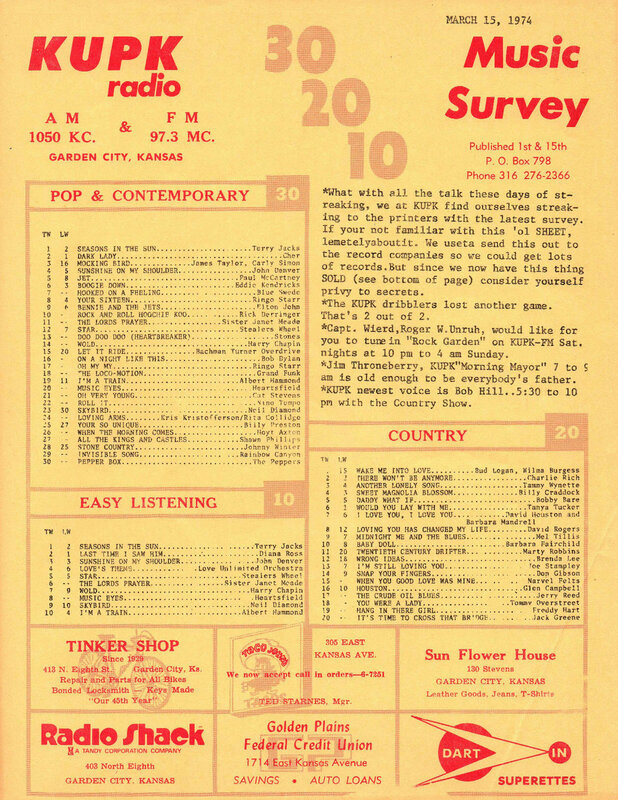 I suppose I might have heard it on an MOR station or two during the mid-1960s, but All-Music Guide does not list it among the group’s Adult Contemporary hits. So I have no idea where I heard the Seekers’ version long ago, but I think I did. Not everyone who covered the song approached it as a folk song. The British group the Move turned Paxton’s tune into a trippy seven-minute opus on its 1970 album, Shazam. As for my favorite versions of the tune, I like the Seekers’ version a lot, and the same goes for the Womenfolk’s take on the tune. And Rick Danko, Jonas Fjeld and Eric Andersen, recording as Danko/Fjeld/Andersen, did a nice version of the song – with Andersen taking the lead vocal – on their self-titled 1991 album. But my list of favorites is going to have to make room for a new version of Paxton’s song. Judy Collins – who recorded the song on her live 1964 album, The Judy Collins Concert – revisited the song in 2010 for her Paradise album, bringing Stephen Stills into the studio to give her a hand. It’s another edition of “Games With Numbers,” this time turning today’s date, August 7 into No. 87 and seeing what records occupied that spot in the Billboard Hot 100 on this date during six years in the 1960s and 1970s. We’ll head back to August 1960 and start there, landing on “You Mean Everything To Me” by Neil Sedaka. A mostly minor key outing, the tune would – I think – rapidly become wearisome. Enough listeners liked it, however, for the record to make it to No. 17 (while the flipside, “Run Samson Run,” got to No. 28). The two sides are sandwiched in the Sedaka listing in Top Pop Singles between two of Sedaka’s bigger hits: “Stairway to Heaven,” which went to No. 9, and “Calendar Girl,” which went to No. 4. The final tally shows Sedaka with thirty-seven records in or near the Hot 100 between 1958 and 1980. Three years later, we find an early Tamla single sitting at No. 87, with the Marvelettes admitting in the tumbling “Daddy Knows Best” that all the advice a young girl gets from her father may make some sense. The record was the sixth by the girls from Inkster, Michigan, to hit the Hot 100, and it went to No. 67. The Marvelettes would continue to put records into and near the Hot 100 into 1969, but none of the other twenty-four records ever equaled the performance of their first hit, 1961’s “Please Mr. Postman,” which went to No. 1 (No 7 on the R&B chart). Traditional pop shows its head as we look at early August 1966, with Al Martino’s “Just Yesterday” sitting at No. 87. I’ve never heard the record before, but as I listen this morning, I hear what are to me unmistakable echoes – melodically, harmonically and thematically – of Frank Sinatra’s “Strangers In The Night,” which had gone to No. 1 just a month earlier. Martino’s single peaked at No, 77, one of forty singles he placed in or near the Hot 100 between 1959 and 1977. The best-performing of those was 1963’s “I Love You Because,” which went to No. 3 on the pop chart and No. 2 on the adult contemporary chart (although I have a fondness for some reason for 1967’s “Mary In The Morning,” which went to No. 27). Sitting in the No. 87 spot on the Billboard Hot 100 on August 8, 1969 was a single that featured names that in a few years would be among the best-known in R&B. “One Night Affair” was the ninth single by the O’Jays to show up in or near the Hot 100. The previous eight had been on the Imperial and Bell labels; this one was on the Neptune label (a division of GRT Records), which called itself “The Sound of Philadelphia.” The label’s founders – who also wrote the song and produced the record – were Kenny Gamble and Leon Huff, who in a few years would spread the Sound of Philadelphia all around the world on their Philadelphia International label. And the record’s arrangement came from Bobby Martin and Thom Bell; I don’t know what happened to Martin, but in the 1970s, Bell – who’d already struck gold working with the Delfonics – would arrange and produce numerous hits for the Spinners, the Stylistics and more. “One Night Affair” peaked at No. 68 (No. 15 R&B), but in three years, the O’Jays – by then recording for Philadelphia International – would see “Back Stabbers” go to No. 3, and six months later, in early 1973, “Love Train” would go to No. 1. The O’Jays would end up with thirty-three records in or near the Hot 100 between 1963 and 1997. In the early days August of 1972, the No. 87 single was one of the slightest hit singles Neil Diamond had to that point placed into the Hot 100. “Play Me” would eventually rise to No. 11, the thirty-first of an eventual fifty-six singles Diamond would place in or near the Hot 100. At the time, I thought “Play Me” was an insubstantial piece of fluff as it trailed in the wake of Diamond’s earlier work like “Sweet Caroline,” “Solitary Man,” “Kentucky Woman” and more (including the album track “Done Too Soon,” which remains my favorite Diamond track). But listening to “Play Me” this morning, and looking at the hits that came later – records like “Love On The Rocks,” “Heartlight” and “America” – I find myself liking “Play Me” a lot more than I did forty years ago. It’s still not a great record; but it’s better than I remembered. A couple of days ago, I posted a preview of today’s post, a video of Los Bravos’ 1968 single “Bring A Little Lovin’,” which ended up peaking at No. 51. What I forgot to mention in that preview was that in the Billboard Hot 100 of May 11, 1968 – forty-three years ago today – the record was sitting at No. 135, on the very last rung of the Bubbling Under section of the chart, with nothing underneath it but air. And it was a great record. That, to me, is the joy of these Chart Digging posts, finding record that were never huge hits but are still records worth hearing. Now, a good number of the records I highlight from the lower levels of the Hot 100 aren’t nearly as good as the Los Bravos side I highlighted earlier this week. After all, I do enjoy records that are odd, and I do shed light on some that are horrendously bad. But they’re all fun, especially those that deserved a wider hearing than they got. So, armed with some books and the irreplaceable assistance of folks who post obscure music at YouTube, I went looking for gems in the lower levels of the May 11, 1968 chart. Well, except for the Goldsboro single, that’s a nice set. The Irish Rovers’ tune isn’t all that great, either, but it’s not nearly as bad as “Honey.” And there are some obvious gems in there. There are a few gems in the far reaches of the Hot 100, too. And I’ve found a couple of things that are more cut glass than gem, but they’re worth a look, too. Among the music the Texas Gal brought with her to Minnesota almost a decade ago was a multi-disc set of Neil Diamond’s music. For me, one of the great surprises in that set was a tune called “Brooklyn Roads.” Brooklyn after World War II – because of its ethnic make-up, because of its proximity to and distance from Manhattan, because of the Dodgers – has become a myth unto itself, and it seems to me that any creative artist who makes the post-war borough a central part of any work risks sliding into cliché. But drawing on his childhood and youth in that New York borough, Diamond manages not only to avoid most clichés (the butcher shop downstairs, true though it might be, is one), but sketches a detailed and moving portrait of himself in that urban setting. “Brooklyn Roads” was at No. 98 forty-three years ago today and would climb as high as No. 58. By May 1968, Diamond had already placed nine records in the Hot 100; he’d wind up with fifty-six, thirteen of them in the Top Ten and three at No. 1. Most folks my age think of Michelle Lee as the gal who played Karen MacKenzie on Knots Landing, the CBS television drama that ran from 1979 into 1993. (That span of years surprised me; I had no clue the show was around for that long.) But in 1968, Michelle Lee made her one appearance in the Hot 100 when “L. David Sloane” went to No. 52. It’s a cute record, and in the Hot 100 from forty-three years ago today, it was at No. 72. Despite knowing many bits of Beatles trivia, I was unaware of the group called Grapefruit until this morning. My first thought when I listened to “Elevator” was that it sounded a fair amount like the Beatles and Badfinger. So I did some digging: Grapefruit was formed by George Alexander, who was also signed as a songwriter by the Beatles’ Apple Music Publishing Ltd. And the group, according to Wikipedia, got some help from the Beatles: “The group was launched by the Beatles with a press conference in 1968, on January 17, with the first single ‘Dear Delilah’. It went to number 21 in the UK single chart in February 1968. Paul McCartney directed a promo film (never released) for the single ‘Elevator’. John Lennon, Paul McCartney and George Harrison attended and helped in their recording sessions for the singles, as Grapefruit didn’t have a producer at the time.” Forty-three years ago today, “Elevator” was at No. 113, and it would go no higher. But it sounds better than that. So I consider the information from Wikipedia, the credit “Produced by: Apple Music Ltd.” on the single and the general sound of the record, and it all makes sense. Another good track I found this morning was a slice of propulsive British R&B. Sitting at No. 126 in the Bubbling Under portion of the chart was “Looking Back” by the Spencer Davis Group. I have to wonder how a record this good can miss, but it didn’t do well, climbing only another thirteen spots before disappearing. It was the last time the Spencer Davis Group would come close to the Hot 100.